We’re out west for the Turning Totems slot machine from Thunderkick. We join a Native American chief, complete with medicine stick and headdress, looking at a series of five totem poles in the desert. At first glance, it’s not immediately clear where the gameboard even is. However, a quick click of the “spin” button and these majestic, traditional sculptures come to life and guess what – they do indeed turn! The gameboard itself consists of five reels and three rows. There is a total of 22 win lines (11 run left-to-right and 11 run right-to-left). To keep the action fresh, Thunderkick have also included a variety of special features. We’ll talk you through how each one workslater on though. Great theme. 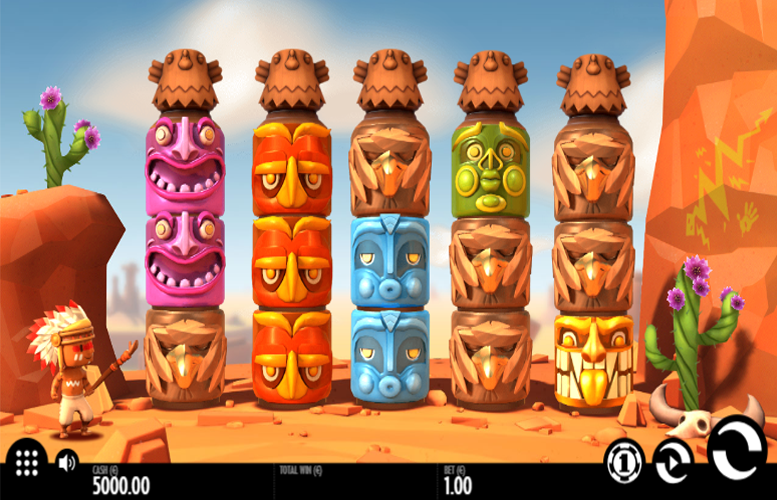 The artwork, the music, and even the gameplay features are all appropriate to the totem pole theme. Colourful, appealing art style. The imagery used throughout Turning Totems is vibrant and we particularly liked how the gameboard itself is part of the background. It all works so well together! Interesting bonus features. Side games aren’t usually Thunderkick’s strong point. However, the ones designed for Turning Totems work very well given the theme. Tragically small main game prizes. At just 25x the total bet for a five-of-a-kind of the most valuable symbol, it’s going to take a good few lucky spins before you can retire off main game winnings alone! Bird “Wild” symbol = 25x the total bet. Orange totem = 10x the total bet. Red totem = 4.5x the total bet. Purple totem = 4x the total bet. Green totem = 2.5x the total bet. Blue totem = 2x the total bet. Brown totem = 0.4x the total bet. All Sleeping “Wilds” on a Thunder Reel will turn into “wilds”. A Thunder Reel activation will grant a re-spin unless it results in a Bonus Game. A Bonus Game is triggered once three or more Thunder Reels are active and consists of five free spins. 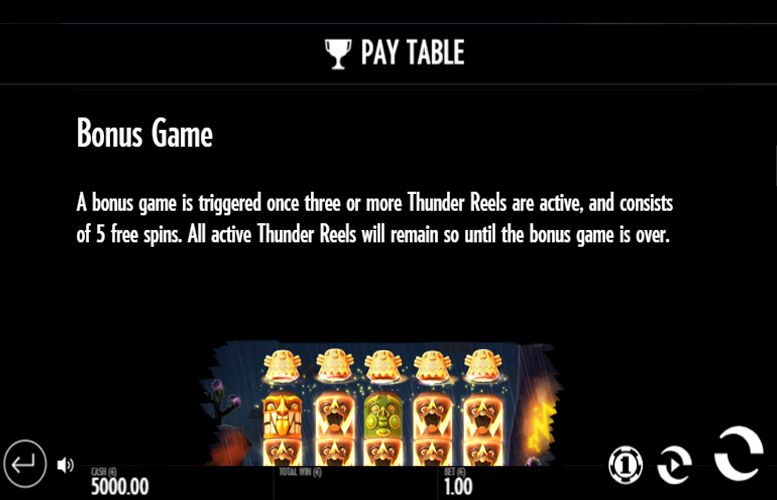 All active Thunder Reels will remain so until the Bonus Game is over. 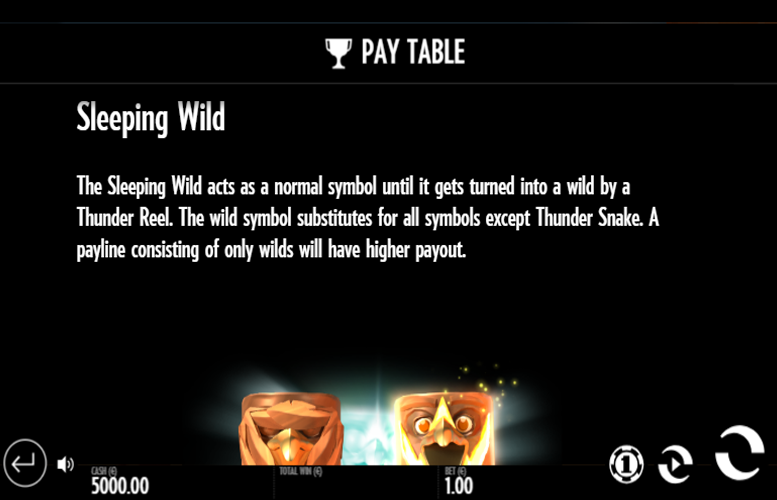 The Sleeping “Wild” acts as a normal symbol until it gets turned into a “wild” by a Thunder Reel. 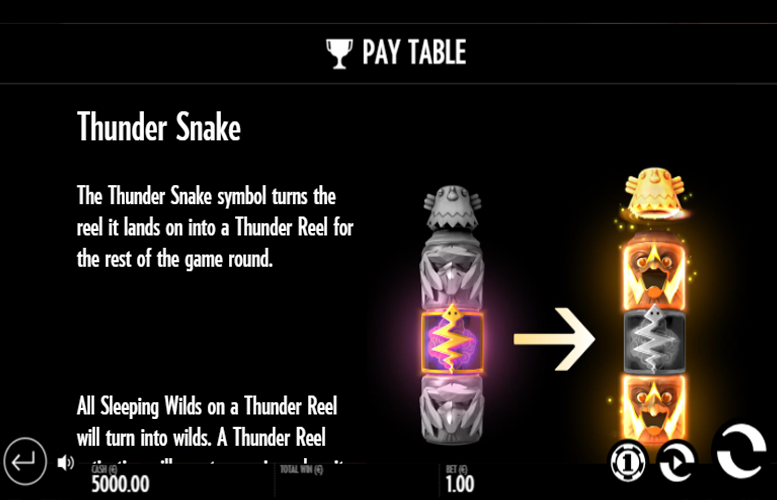 The “wild” symbol substitutes for all symbols except the Thunder Snake. A pay line consisting of only “wilds” will have a higher pay out too. 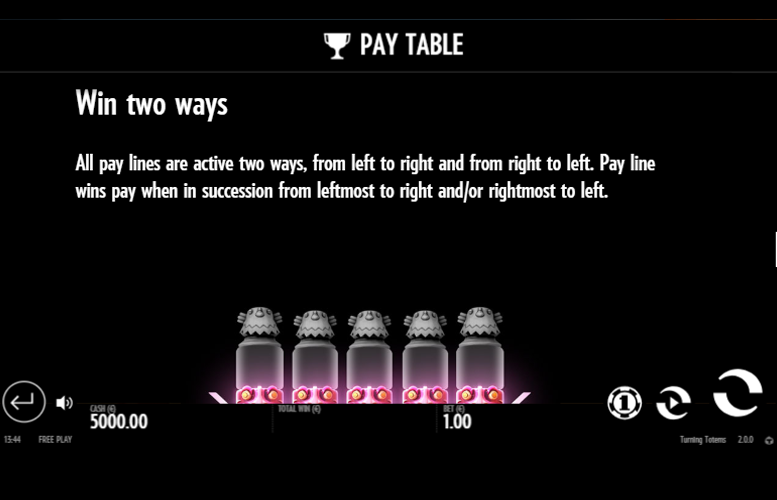 Each pay line on the Turning Totems slot machine runs both left-to-right and right-to-left. This substantially increases the number of chances players get to win big! 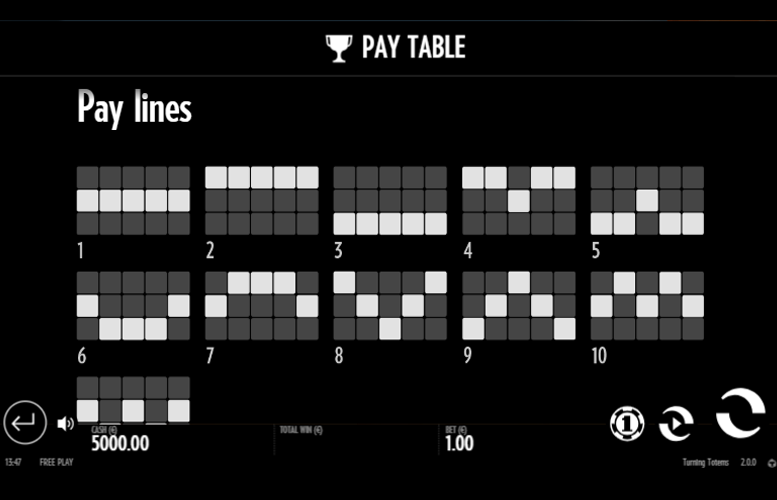 Unlike many modern video slot machines, there are no options to alter either the number of win lines or the amount bet on each one on the Turning Totems game. This means players are limited to just a range of total bet amounts and therefore have little control over how they distribute their bets on the title. There are 12 total bet amounts on the Turning Totems slot machine. They range from a minimum value of just 10p up to a more-than-reasonable £100. We’re sure you’ll agree that Thunderkick have made an effort to appeal to most sized bankrolls with these options. However, those wishing to seriously splash the cash might find them a little on the smaller side. Thunderkick really got creative with Turning Totems. It’s refreshing to see a slot design team take such an innovative approach to marrying theme and features on an online slot machine. However, it’s not just a creative gameboard that made the game appeal to us. We also liked the gameplay features throughout and although they’re not exactly revolutionary, they work excellently given the totem pole theme. It’s not all good about the game, however. 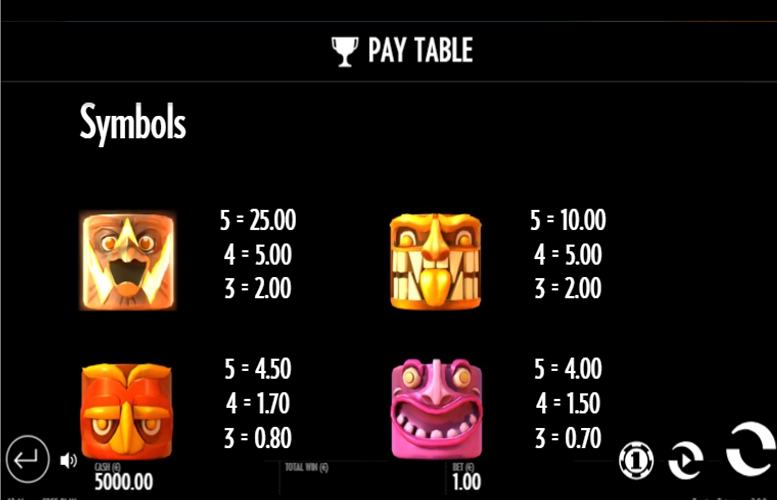 We couldn’t give Turning Totems a perfect score because of its low main game prizes. Some players just aren’t interested in slots that pay such small amounts hitting the largest winning combinations! This game has a rating of 4 / 5 with 631 total reviews by the users.